Be Bold. Be Brave. Be Honest. Advanced technology combined with the superpowers of cannabinoid oil. Intrigued yet? Well, you should be, because that is what the DROP Effect provides for your pet. I do not believe in coincidences. I received a call from a client who was welcoming a new foster dog to her home. This young dog, less than a year old, had only known the research lab and traveled up from the southern US and she wanted me to work with him to help him learn positive touch and be a better candidate for adoption. As I packed my car for the initial consultation, I mentally itemized my arsenal. Essential oils, check. New client consent form and waiver, check. CBD oil, check. Winning personality and animal whisperer persona, check check. I confess I do not bring CBD oil (also known as phytocannabinoid oil) to my appointments as a rule or give it to clients without a veterinarian’s permission and clearance. For dog’s already using CBD oil under their doctor’s guidance, sometimes this helps to take the edge off high-anxiety animals before a sports massage appointment. While massage calms the body and mind, a relaxed dog achieves the best results. The owners must dose their animal at home about an hour beforehand to give this natural supplement a chance to work. But the day gets busy or they had to leave the office, and sometimes my client didn’t receive their supplement. DROPS for Pets is a fantastic alternative to those animals needing to calm and achieve balance quickly. There are many questions about the benefits of CBD oil for animals and even people. The answer is that most animals have endocannabinoid receptors. Tied to the central nervous system these receptors regulate a variety of physiological and brain functions including, but not limited to: metabolism, mood, pain sensation, and more. The CBD oils naturally adhere to these receptors and help to balance the body from within, wherever they are needed. A one-size-fits-all type of alliance. When it comes to my personal life, I use CBD oil to calm my reactive dog Beau on walks or car rides, reduce pain and joint inflammation in Gonzo and help Ferrous the pony relax and have fun on trail rides. This is all in addition to recommending phytocannabinoids in my animal massage therapy practice. Do you remember the coincidence comment? It was only recently I learned of a pet product that goes into effect almost instantly. That’s right, no more waiting an hour for the CBD to activate. I don’t review all the products or companies that contact me, but I was very interested in learning more, especially if it could help this puppy for a loving, forever home. Globally the pet industry has increasingly welcomed the use of CBD oil to reduce pain, inflammation, and anxiety while creating more balance naturally. But what is to separate the different hemp companies from each other? Sourcing, yes. Quality, of course. But NEWYOU has created a technologically-advanced CBD oil in the new DROPS for Pets product using nanotechnology. That is the magic ingredient to help it work so quickly. A nanometer is a unit of measurement equal to one-billionth of a meter. Scientists are increasingly able to create, control, and change materials on the nanoscale which can have different, often stronger, properties than those the size of atoms or molecules. DROPS for Pets providesNano-Amplified™ cannabis in a water-soluble form. Nano-Amplified™ increases absorption. Photo courtesy of NEWYOU. The result is a product that is potentially 10 x stronger than standard oil-based tinctures and is both tasteless and odorless. More, instead of processing through the digestive system like treats or oils, the CBD begins working as soon as it is ingested because it is absorbed through the cell wall. This product is sourced in the USA with a 99.7% or higher purity level. More, according to their literature, the company uses Farm-Bill Compliant Hemp, which is organic, non-GMO, and THC free so your pets are receiving the highest-quality product. NEWYOU uses a CBD isolate rather than full-spectrum hemp and the company is focused on the nanotechnology. DROPS for Pets comes in a 50 mg bottle of Nano-Amplified™ CBD (which is equivalent to 500 mg of standard CBD oil). The easy-to-use squeeze bottle is convenient to carry while on the go. It snaps closed, but fits in a purse, pocket, and tack box at the barn! In DROPS for Pets, the recommended dosage is a 1/2 squeeze to 1 squeeze daily (1.4 ml) into your animal’s water container. Because a “squeeze” isn’t scientific it is hard to know how much I am providing. For example, my squeeze uses less pressure than my husband’s squeeze. Therefore, it stands to reason he would dose more in a single serving than I would. I always begin with the “less is more” philosophy when it comes to all things. I use the smallest dosage for hemp products and gradually increase as needed. Even if my dog is being pushy (see video). The nice thing is this product works quickly and I know very soon whether I need to provide more for the vet appointment, car ride, or generalized anxiety that I am trying to help reduce. A water-soluble phytocannabinoid like DROPS for Pets would be particularly helpful for horses on stall rest. Dosage for dogs should be based on weight. That being said, I also am a big proponent of phytocannabinoids in horses for calming on trail rides, stall rest, and reducing joint inflammation. I do love that I can include the DROPS for Pets in my horse’s water, however, the likelihood of him drinking an entire bucket is low as he spends a lot of time in the paddock, so I would add it to his grain or try to provide directly into his mouth somehow. That being said, adding a dose to the bucket is a wonderful solution for stall rest. Because horses are sensitive, a veterinarian with knowledge and experience in hemp products will usually recommend the same dosage given to a large dog. Nano-Amplified™ DROPS for Pets is easy to take on the go for car rides, vet appointments, and traveling with your pet. The packaging fits in your pocket or purse, is easily added to water or food, and because it’s odorless and tasteless, will be perfect for even those picky eaters. I also tried the DROPS for humans in my water bottle and was impressed with the results. This phytocannabinoid oil worked quickly and took the edge of my anxiety, not easy to do when traveling to New York City with my daughters to see the Trolls Experience! But it lasted the entire day, and I did not have to take another dose. I would love to see NEWYOU come out with equine-friendly product packaging in the future allowing for more measurable dosage as well as adding a syringe or dropper so that the product could be administered with a direct oral application. My dogs and I did very well on the DROPS and I would recommend this product for owners who are looking for a fast-acting phytocannabinoid oil for their animals. I’m happy to say that my new foster friend, Gunther, did not need hemp during my visit, but I’m happy to know I have a future option to help that works quickly. To learn more about DROPS for Pets, visit their website. My name is Heather. 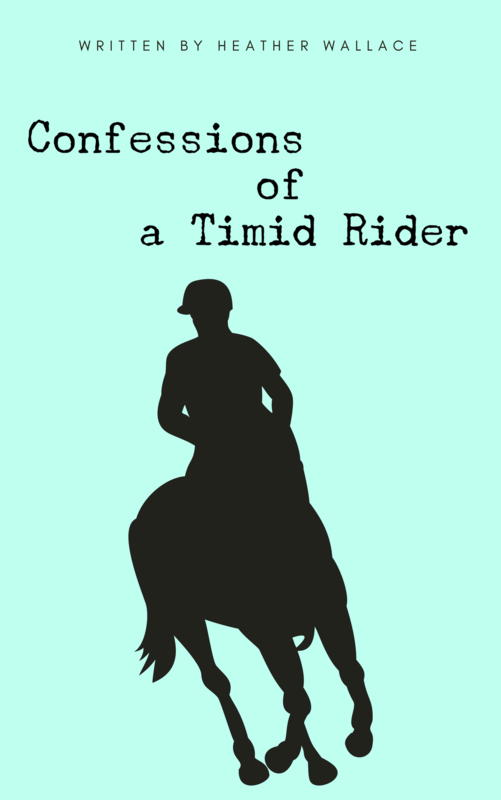 I stepped away from horses as a teen due to anxiety and regretted it ever since. Now I'm back but things are a little different now. I'm a mother, I'm less flexible, and I'm a lot more nervous. The biggest difference? I'm following my passion despite lacking confidence. Join me as I talk about all those things we think but don't say out loud. Want a discount on pet probiotics? © 2018-2019 Heather Wallace, All Rights Reserved.